Thirteen-year-old Justin Miller of Greystone, TN, resides with his parents, Ken and Dana Miller, and his three-year-old sister Kenslee. Ever since Justin was able to walk, he followed his grandparents around the garden, learning and helping as he grew, and liked it. He has always had a fascination with growing things. As soon as he was big enough, he began tending a garden plot of his own. 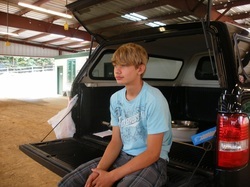 Now, at 13, Justin is in charge of his own small farm on a couple of acres. His father drives the tractor, doing the plowing and tilling (Justin will take over that aspect when he’s old enough), but for some time now Justin has been solely responsible for all the seeding and planting, weeding, spraying to control insects, fertilizing, harvesting, and cleaning and packing what’s being trucked to market. Some of what Justin grows and harvests is brought into the family home to be eaten or canned, and the rest is trucked by Justin and his dad to the Greeneville Farmers Market, where Justin is one of our newest vendors. Justin even establishes the prices of the seasonal produce being sold, and does any negotiating with customers. “He’s learning all aspects of farming and selling,” said Mr. Miller. When asked whether his responsibilities leave him time for school, homework, and some recreation, he said, “Sure. I go dirt-biking or 4-wheeling, and hunting and fishing, and still get my homework done and, yes, get some sleep too.” When asked, “What do you like least about school,” he slowly replied, “Uh, teachers…” And when asked what he liked best about school, he said “Friends, and women.” Justin, at 13, is looking forward to being licensed to drive. At the Greeneville Farmers Market, Justin was asked, “What’s the name of the farm or business?” and he and his dad suggested “Millers Farm” would do for a name. Justin’s successfully farming a couple of acres, and his father’s pride in him is quite evident. “The lad is doing what he loves, and doing it well. We want to support him in every way we can,” says Ken. Mr. and Mrs. Miller plan on leaving the farm to Justin, and they know it will be in the best of hands.